One of George Lucas's greatest creative decisions was using a live symphony for the Star Wars soundtrack. Why? Because he knew that orchestral music is timeless. One of the easiest ways to tell which decade a TV show comes from is to wait for the first music cue. 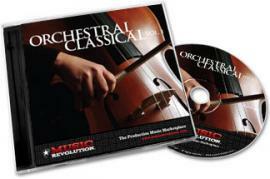 But orchestral music, with soaring strings, brass, percussion and wind instruments transcends all fads and trends. This royalty-free CD contains stunning tracks that use the same classic instrumentation used for every great story told since Wagner's Ride of the Valkyries.